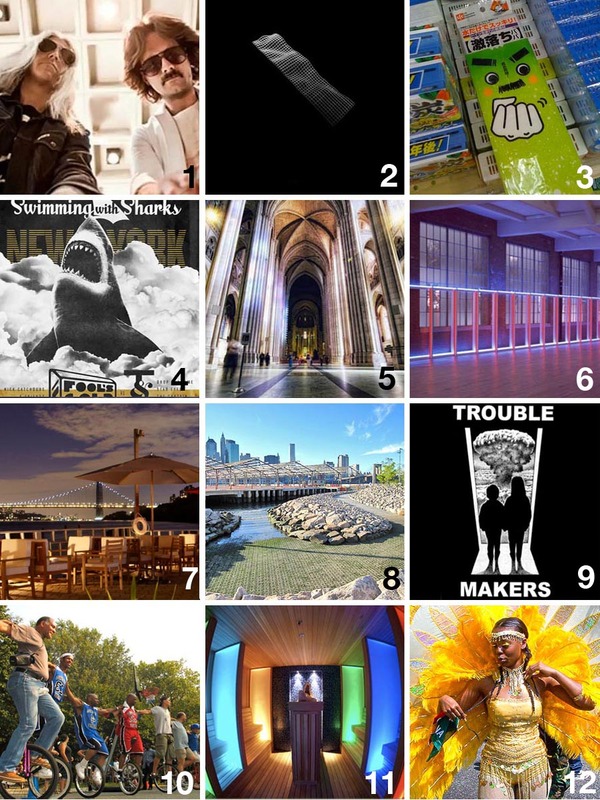 Here are our free and cheap suggestions for things to do this Labor Day weekend 2012 (August 31 to September 3) in NYC. We’ve included some staycation ideas as well as fun and easy day trips within an hour or two from New York via public transportation. 1. Music- AM & Shawn Lee at the Knitting Factory. Friday 8/31. Doors 7pm. Show 8pm. $10 to $12. 3. Day Trip/Food/Culture – Mitsuwa Marketplace A little taste of Tokyo only a bus ride away. In Edgewater, NJ, this shopping center immerses you in Japanese culture with a food court, books, magazines, toys and a supermarket filled with Japanese products. Take the shuttle bus from Port Authority. $3 each way. All weekend. 4. Music/Party – Swimming with Sharks at The Standard’s Le Bain. Saturday 9/1, 3pm-9pm. FREE with RSVP. 5. Architecture – Vertical Tour at the Cathedral St. John the Divine. No need to go to Europe to tour a spectacular church. This tour takes you up to parts of the Cathedral you never knew existed! Saturday 9/1, 12pm still available. $15 Get tickets here. 6. Day Trip/Art – DIA:Beacon in Beacon, NY. Beautiful galleries filled with spectacular installations and all your favorite contemporary artists. MetroNorth from Grand Central or 125th Street gets you within steps of the building, 80-minute train ride. Train and admission package: $31.50 for Adults. All weekend. 7. Food/Views – La Marina in Inwood. It’s a waterfront resort in Manhattan. Beautiful views of the Hudson and GW Bridge. Take the A-train. Alternatively in Food/Views: Brooklyn Crab in Red Hook on the waterfront. Free Shuttle Bus or the IKEA Water Taxi from Pier 11. All weekend. 8. Architecture Tour – Before Brooklyn Bridge Park. Learn about the history of Brooklyn’s waterfront with architectural historian and author, Matt Postal Saturday 9/1, 11am.$20. Tickets. 10. Fun/Leisure – Unicycle Fest on Governors Island. World-famous riders will display their skills, and members of the public will have the opportunity to try one-wheel riding. Saturday 9/1 and Sunday 9/2, 12pm to 5pm. FREE. 11. Day Trip/Relaxation/Food/Fun – Spa Castle. Okay, maybe not so free or cheap but if you consider what a spa trip costs…this looks pretty good. We’ve yet to try, but have heard good things. A sort of “Disneyland” of spas, in Queens no less! Weekdays $35; weekends $45. 12. Fun/Music/Food/Culture – West Indian Day Parade and Festival, Eastern Parkway near Brooklyn Bridge Museum. Labor Day, Monday 9/3 starts at 11am. Also, in Comedy/Improv: The Friday Night Sh*w at the Magnet Theater in Chelsea. Friday 8/31, 11:30pm $5. Art/Music/Design/Experiment: Stranded V: Laboratory, a night of eureka moments, bold experiments and a Nobel-worthy science fair built by King’s County’s creative catalysts. Saturday 9/1, 10pm-5am, at the Pfizer plant in South Williamsburg, Brooklyn. Near the JMZ and G trains. 21+. $26 Tickets here. Music/Food: Mister Sunday Labor Day Weekend Special; Eamon Harkin and Justin Carter at Gowanus Grove. Sunday 9/2, 3pm-9pm. $10 advance; $12 door. Or check our previous Culture on the Cheap posts for links to Free Met Opera HD, PS1’s WarmUp, and ongoing museum exhibits that we recommend. Have a great weekend and check back for possible updates! This entry was posted in Architecture, Art, Food, Fun, Music, NYC, Photography, Pop Culture, Stuff We Like. Bookmark the permalink.